Most folks read my blog through the RSS feed, but those who peruse the web version get to see many different forms of navigational aids to help the user around the website. Since the blog runs on Drupal , I get to deploy all sorts of fun stuff. One example is the Similar Entries module, that uses MySQL’s FULLTEXT similarity to show possibly related posts1. This allows you to jump around on the website reading posts similar to each other, which is especially useful for readers who come in from a search engine result page. For example, they may come in looking for Magic Bus for the iPhone , but given that they’re probable iPhone users, they may be interested in the amusing DIY iPhone Speakers post. Each bar represents the number of blog posts I posted that month, starting from August 2002 until now2. Moving your mouse over each bar tells you which month it is. This visualization presents many interesting bits of information. On a personal note, it clearly represents many stages of my life. June of 2005 was a great month for my blog — it had the highest number of posts, possibly related to the fact that I had just moved to Bangalore, a city with and active Blogging community. There are noticeable dips that reflect extended periods of travel and bigger projects. Many of my posts are manually categorized using Drupal’s excellent taxonomy system. A traditional solution to this is to create sections, so that the user can easily browse through all my Poems or my nerdy posts. The problem is that this blog contains notes and links to things that I think are “interesting”, a classification that has constantly evolved as my interests have changed over the past decade. Not only is it hard for me to box myself into a fixed set of categories, maintaining the evolution of these categories across 7+ years is not something I want to deal with every day. This is where tags and automatic term extraction come in. As you can see in the top footer of the blog mainpage , each dot is a topic, automatically extracted from all posts on the website. I list the top 60 topics in alphabetical order, where each topic is also a valid taxonomy term. The aesthetics are inspired by the RaphaelJS dots demo, but just like the previous visualization, it is done using pure CSS + HTML. The size and color of the dot is based on the number of items that contain that term. Hovering over each dot gives you the label and count for that dot, clicking them takes you to an index of posts with that term. This gives me a concise and maintainable way to tell the user what kinds of things I write about. It also addresses a problem that a lot of my readers have — they either care only about the tech-related posts (click on the biggest purple dot! ), or only about the non-tech posts (look for the “poetry” dot in the last row!). This visualization works by first automatically extracting terms from each post. This is done using the OpenCalais module (I used to previously use Yahoo’s Term Extractor, but switched since it seems Yahoo!‘s extractor is scheduled to be decommissioned soon). The visualization is updated constantly using a cached GROUP BY block similar to the previous visualization, this time grouped on the taxnomy term. This lets me add new posts as often as I like, tags are automatically generated and are reflected in the visualization without me having to do anything. So that’s it, two simple graphical ways to represent content. I know that the two visualizations aren’t the best thing since sliced bread and probably wont solve World Peace, but it’s an attempt to encourage discoverability of content on the site. Comments are welcome! 1 I actually created that module (and the CAPTCHA module) over four years ago; they’ve been maintained and overhauled by other good folks since. 2 Arnab’s World is older than that (possibly 1997 — hence the childish name! ), but that’s the oldest blog post I could recover. Many readers have complained that this blog is always full of artsy and time-wasting material… “what about all the technical stuff? Aren’t you a computer person? !” they ask. To pacify these masses, I have just converted three of my recent papers to HTML format. For the first two, I used the HEVEA LaTeX to HTML converter, which I found slightly better than LaTeX2HTML. For the 3rd paper, I have inexplicably misplaced the source files, and hence the HTMLization was done via Gmail’s PDF Viewer. Keyword search against structured databases has become a popular topic of investigation, since many users find structured queries too hard to express, and enjoy the freedom of a “Google-like” query box into which search terms can be entered. Attempts to address this problem face a fundamental dilemma. Database querying is based on the logic of predicate evaluation, with a precisely defined answer set for a given query. On the other hand, in an information retrieval approach, ranked query results have long been accepted as far superior to results based on boolean query evaluation. As a consequence, when keyword queries are attempted against databases, relatively ad-hoc ranking mechanisms are invented (if ranking is used at all), and there is little leverage from the large body of IR literature regarding how to rank query results. We demonstrate a novel query interface that enables users to construct a rich search query without any prior knowledge of the underlying schema or data. The interface, which is in the form of a single text input box, interacts in real-time with the users as they type, guiding them through the query construction. We discuss the issues of schema and data complexity, result size estimation, and query validity; and provide novel approaches to solving these problems. We demonstrate our query interface on two popular applications; an enterprise-wide personnel search, and a biological information database. Ok, so here you go! How this works: Your favourite artist is first searched for on Seeqpod. 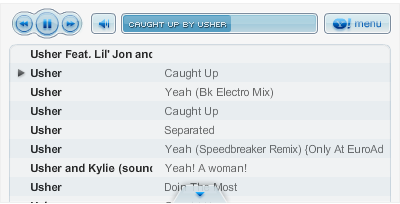 Then, the Yahoo/Webjay XSPF player is used to play the searched flahs m3p songs. The beauty is that you (or I) don't have to host or worry about any file uploads, etc, so it's all painless! Update: It seems that this work was done at NTT’s DoCoMo Labs, with Ravi Jain and Neil Daswani having moved to Google recently. Why is this on the Google blog then? Amit Agarwal: This 'Netahoy' gizmo dude is the only other Delhi blogger I know. Anita Bora: Rediff's shining star. Also keeper of the Indian Blogger's List, a insurmountable feat in itself, considering it's a single HTML file. Cameron Marlow: That dude who created Blogdex. Also Ph.D. student at the Media Lab. and also into the music scene. Not exactly role model, but something incredibly close. Gaurav Sabnis: CEO in the making at IIM Lucknow. He's in the list because of the Calvin&Hobbes cartoon on his page. Also because of the content, but the cartoon ownz. Use a 'scraper' to scan your HTML page and generate an RSS feed for you. Everyone is talking about Macromedia's Contribute. But what I don't understand is that how it's so revolutionary. How more easy to use is this than a customized content management system? If this has something to do with being able to edit static webpages without having to open them in DreamWeaver of Frontpage, how about a Wiki with a WYSIWYG edit box?